I went into a Breath of Eyre without reading the original "Jane Eyre" or any previous retellings, therefore I had no expectations. A Breath of Eyre was a refreshing retelling where Eve Month that took an original story and made it her own. People who already read Jane Eyre will be surprised by the twist and turns in this book. A Breath of Eyre has two separate POVs, they are both told from the same female protagonist, Emma, however one is set in the modern world while the other is set in Jane Eyre's world, and Emma finds herself playing the role of Jane! Emma gets transported back in time from her complicated life and Jane's life. As Jane, she doesn't know if she should make the same decisions as her or "re-write history" and it here is where the book gets its own unique voice, based on Emma's decisions. I personally preferred the modern day POVs because I like reading about "THE MOMENT" not the past or something that won't really have an impact on someone's life, however it was pretty interesting and quite creepy at times because of the secrets Mr.Rochester (Jane's love interest) hides in his "third floor". My only issue with the book is the supporting characters, I thought they felt a bit flat and didn't have much depth which is why I couldn't care less about any of them, also for Emma's love interest, he had major problems that were sort of dumped on us and I just felt a bit overwhelmed with them. 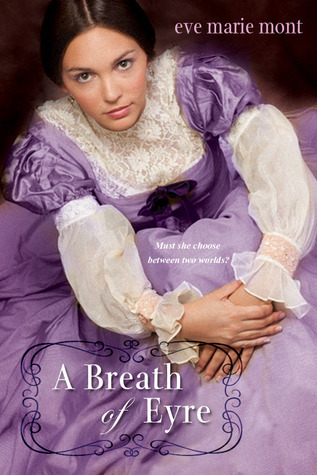 All in all, A Breath of Eyre is definitely a great retelling of another classic story and I recommend it to fans of Jane Eyre and Jane Austen books. Also, even though this book felt like a standalone, it is actually part of a series. Therefore I am pretty excited to find out what is in store for Emma after she found her "happily ever after"
Great review, Juhina. I'm going to read this one this month hopefully but I think I'll try to read Jane Eyre first! I read Jane Eyre so long ago but think I've seen every single movie and TV adaptation there is. This book never really appealed to me at first but it sounds like it is worth the read. Great review! I haven't read Jane Eyre so I'm unsure how I would like this. Sounds interesting though! Great review! I have this on my nightstand now and I can't wait to get to it. Looks awesome and I am definitely one for Jane Eyre-type stuff.